A vintage photo of the Pier 66 hotel in Fort Lauderdale, site of The Hukilau in June 2015. Expect a major announcement this week from The Hukilau, the annual Tiki event in Fort Lauderdale that draws enthusiasts from around the world. Passes and tickets will be going on sale for the June 10-14 festivities, which for the first time will take place at the iconic Hyatt Regency Pier 66 hotel along with the historic Mai-Kai restaurant. 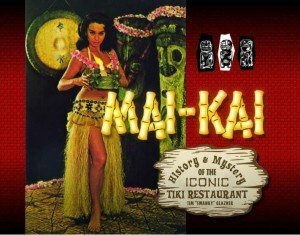 [See previous story] The impressive entertainment lineup will include six symposiums on Tiki and Polynesian Pop history. More details will also be released on author and fledgling bar owner Jeff “Beachbum” Berry’s special event in the hotel’s signature Pier Top Lounge. The musical lineup will include an array of exotica, jazz, surf and rockabilly bands. For updates, check TheHukilau.com and the Facebook page. The Atomic Grog will also have full coverage. Lost Lake could be opening in Chicago’s Logan Square area as soon as this week. The new bar from Paul McGee, creator of Three Dots and a Dash (named Best New American Cocktail Bar at Tales of the Cocktail) quickly follows McGee’s departure in December from the restaurant group that ran his former establishment. According to an article in Chicago Eater, Lost Lake will have a more neighborhood feel with a capacity of around 75. McGee was quoted by Time Out Chicago as saying that the decor will be “more 1930s Tiki than 1960s Tiki.” The rotating drink list will have about 16 cocktails, including some of McGee’s favorites from Three Dots, but it will be “a little bit weirder,” he said. In addition, Martin Cate, owner of San Francisco’s acclaimed Smuggler’s Cove, will host a rum club that promises more than 275 selections. Here’s a look back at the highlights of the past week. Click here or scroll down for info on how to keep us in the loop. 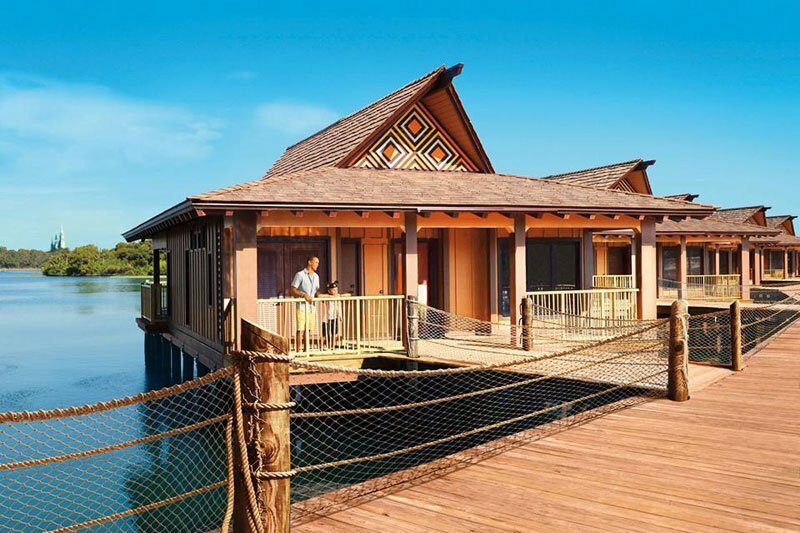 Concept art for the Bora Bora Bungalows at Disney’s Polynesian Village Resort. Each of the 20 bungalows will sleep eight and feature two bedrooms, two full bathrooms, a kitchen, washer and dryer, and large dining and living room spaces. Private decks will include a plunge pool and plenty of room to watch the Electrical Water Pageant and Magic Kingdom fireworks, complete with the soundtrack pumped through an individual sound system. 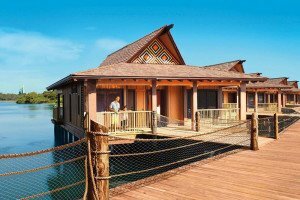 But before you get too excited, “preliminary unconfirmed pricing information” estimates that guests will pay $2,100 to $2,900 per night, depending on season, for one of the bungalows. 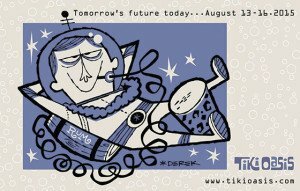 * The best site for continuous updates on the Polynesian Village refurbishment is Steve Seifert’s Tikiman Pages and accompanying Facebook page. 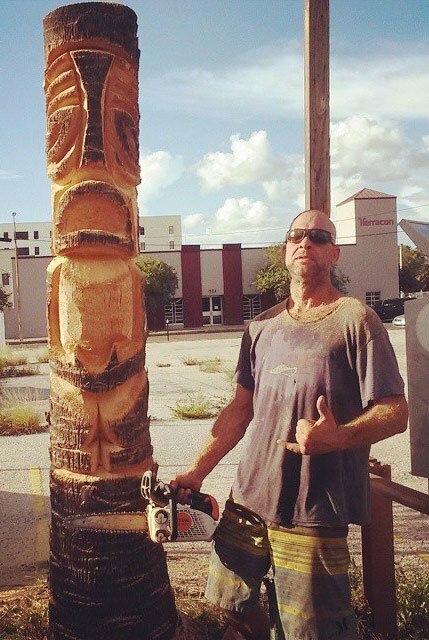 Tampa-based Tiki carver Jeff Chouinard was not content to simply create his artwork for commercial purposes, not to mention his growing legion of fans. Chouinard recently went guerilla, making a name for himself by carving Tikis out of dead palm trees on public spaces all over the bay area. [Creative Loafing story | Tampa Bay Times video] For the most part, the powers that be don’t seem to mind, though Chouinard says he has an attorney ready to defend him just in case. Beyond this ballsy stunt, Chouinard has true talent as a carver, and one of best efforts was recently installed at The Mai-Kai in Fort Lauderdale (see photo). Chouinard epitomizes a new breed of artists with a can-do spirit and unlimited ambitions. * Visit him at SurfSoulTiki.com and Facebook. There’s been a surprising resurgence in classic exotia groups releasing great albums over the past several years, from Southern California to Japan to Sweden and beyond. One ensemble that sometimes doesn’t get the recognition it deserves is the Stolen Idols, toiling away in Tampa, far from the Tiki hotspots. Moonlight Offerings, the band’s first full-blown album, was released in May and easily stands alongside any top-tier contemporary jazz/exotica release. The 13 songs pay homage to mid-century masters Martin Denny and Les Baxter while also giving listeners a contemporary experience with plenty of original tunes. The cover art by Robert Jimenez is icing on the cake. When Jeff “Beachbum” Berry says he created his own competition, he’s only half kidding. 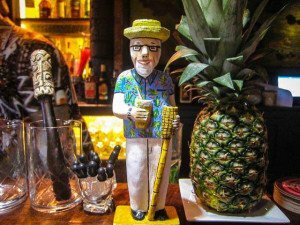 In the 17 years since he released his first of six books on Tiki cocktails and culture (Grog Log, 1998), the modest and self-deprecating author has inspired a generation of enthusiasts to literally raise the bar, totally changing the landscape of the modern cocktail world. Berry nows comes to the plate to show the kids how it’s done with his first establishment, Latitude 29 in the French Quarter of New Orleans. The intimate lounge and restaurant opened Nov. 12, serving “exotic drinks and chow” in a classy atmosphere reminiscent of Trader Vic’s. But this is not your father’s Tiki bar. Berry and his acclaimed staff are pushing the envelope with their cutting edge cocktails and food. With last month’s easing of U.S. sanctions against Cuba, there was a collective cheer from American rum lovers who have been denied easy access to some of the world’s best spirits for the past 54 years. Travelers will soon be able to return to the U.S. from Cuba with small amounts of rum, but in the meantime I was lucky enough to secure a bottle of this aged white rum from a third party in another country. 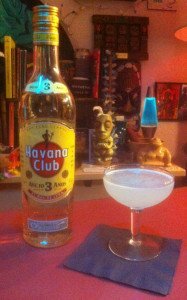 Havana Club Anejo 3 Años has quickly become the best white rum in my bar, edging out the much cleaner and more traditional Havana Club Añejo Blanco. Three years of aging imparts this rum with great woody and spicy flavors, making it perhaps the best Daiquiri rum in the world. More at HavanaClub.com. 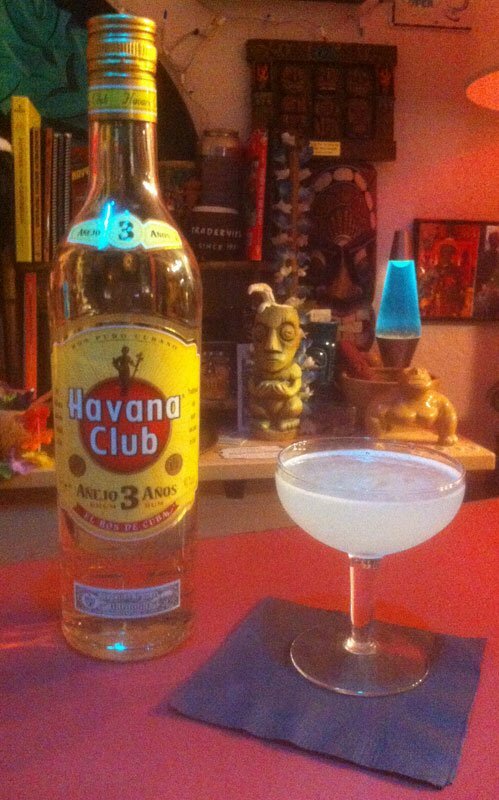 Simple and elegant, this is one of the prototype cocktails from Cuba that inspired Trader Vic and other Tiki pioneers. It’s a great small sipper with a clean white rum, but even better with a flavorful aged rum such as Havana Club Anejo 3 Años. There’s much debate about the proper amount of lime juice and sugar to use, but feel free to adjust to your particular taste. I like the proportions above. A great new addition to the rum and Tiki cocktail scene when it launched in 2013, this site serves as the home base of Kevin Upthegrove’s informative podcast that serves up “notes on rum, a few minutes at a time.” His talks can actually stretch to 20 minutes or more, but there’s no filler and Upthegrove delivers some of the best insights and advice for rum drinkers and Tiki cocktail fans. All the podcasts are posted on the site, so you don’t necessarily need to subscribe in iTunes (though I recommend you do.) You’ll also find nice tips on proper tropical mixology tools and techniques, making homemade syrups, and a handy list of rums you can substitute in cocktails. * Jan. 24 – Revenge of the Tiki lV, Kreepy Tiki Lounge, Fort Lauderdale. Featuring 20+ bands, burlesque, car show, vendors. 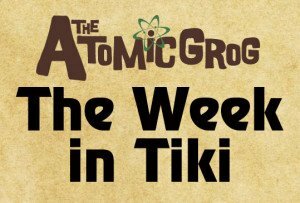 * Jan. 24 – Planet of the Lost Tikis, Indian Harbor Beach. Live surf music, Tiki cocktails, artists, vendors, tiki carving. This entry was posted in 2015, Art, Cocktails, Culture, Disney World, Events, Events, Hukilau, Music, Other Florida, Recipes, Resorts, Rum, South Florida, The Week in Tiki and tagged 5 Minutes of Rum, Beachbum Berry, Disney's Polynesian Village Resort, Havana Club, Hukilau, Jeff Chouinard, Latitude 29, Lost Lake, Paul McGee, Pier 66, Polynesian Resort, rum, Stolen Idols, Three Dots and a Dash. Bookmark the permalink. Hello: We would love to get a copy of the vintage photo on the top of this page (Pier 66). 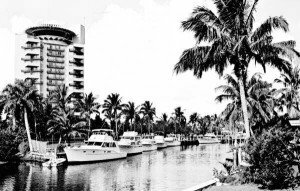 We are doing black and white Fort Lauderdale pictures on our wall and love this one. Happy to pay for it, please let us know.